First off you might be asking, Just what is Jojoba (ho-HO-bah) Oil? The best Jojoba Oils can be used for your face, hair, skin, and nails. Men love it for a softer more natural looking moustache and beard. Discover the best uses for Jojoba Oil reading more below. Native Americans used the oil from the seeds for treating their wounds and sores. In the early 1970s, Jojoba was grown for production rather than searching for it in the southwest or California. It was also used during WWII by the USA for adding to motor, transmission, and differential gear oils. Even machine guns used Jojoba for lubrication. But let me tell you about the plant first. It is a light golden liquid from the seed of the Jojoba (Simmondsia chinensis) from the shrub that is indigenous or native to southern California, Arizona, and northwestern Mexico. It is called Jojoba Oil and Jojoba Wax. It has a long shelf-life and is resistant to hot temperatures as compared to genuine vegetable oils. It isn’t really an oil; it’s a liquid wax ester structurally different from triglycerides. It does not tun rancid like other oils, since it has no triglycerides that are fats. Grapeseed Oil, Almond Oil, and Coconut Oil are considered vegetable oils and have fat that will oxidize turning rancid over time. 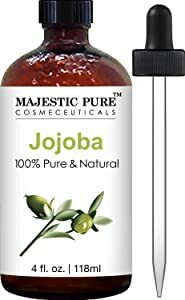 Jojoba is used in cosmetics, lotions, shampoos, best Jojoba hair conditioners, moisturizers, and for the skin, nails, and cuticles in the pure oil form. I will provide you with data about the best brands of Jojoba Oil for your face in this article. What is sebum? It is an oily or waxy lubricant in the very tiny exocrine glands in the skin that secretes the substance sebum from the sebaceous glands for lubricating and waterproofing our skin and hair. The largest amount is on the face and scalp but not the soles of the feet or hand palms. Since sebum involves acne and sebaceous cysts because the glands are overactive, we can use Jojoba Oil for acne and pimples. Jojoba is similar to human sebum because it is chemically and structurally similar to wax mono esters. Since having LASIK for my eyes, I’ve learned about the meibomian glands on the eyelids for keeping the eyes from having dry eye syndrome. The sebum here produces a special type of sebum for tears. It flows like olive oil not like sticky toothpaste for perfect moist eyes normally. As we age, these glands become thick rather that fluid for moisture. A comedo is a type of pimple, or lesion that can form on your skin. Pimples differ according to their appearance and what causes them. Therefore, Jojoba Oil will not clog your pores or give you an allergic reaction. It never feels greasy, because it is not and is safe to use around your eyes. With beneficial minerals and vitamin E, B-complex, copper, zinc, selenium, iodine, and chromium it will encourage clear and healthy skin and hair. Jojoba Oil protects you from free radicals because it is an antioxidant. Scientists think that free radicals can cause many chronic diseases and cancer. As a fungicide, Jojoba Oil is antibacterial and is used to control mildew and mold. Jojoba Oil uses and benefits video. The Leven Rose® a best brand for Jojoba Oil comes from Arizona and is packaged in Colorado Springs, Colorado, USA. It is cold-pressed using an expeller that is similar to a screwing action to press the oil, that is really a wax, without heating the oil. Keeping the oil from becoming hot is an important factor for not losing chemical properties due to heat. It is unrefined, meaning the essential components are maintained for your therapeutic benefit. As usual and best for all essential oils, the Jojoba Oil is packed in dark amber glass bottles with a glass dropper for measuring. In my other articles about bottle colors, I mentioned that the dark bottles of brown, purple, blue, and green are to protect the oils from sunlight, heat, and oxidation that can leave the product less effective. Skin Hair and Nails for a smooth, silky, and healthy hair roots and hair strands to alleviate the dry frizzes, split ends, and brittleness. Eyes and Face for makeup removal and mascara to leave your skin soft, dewy, and radiant. Face Moisturizer for a radiant glow. Body Moisturizer alone or with your best-smelling essential oils. Body Massage as a carrier oil with 100% pure essential oils for a soothing experience after a hard day. Dry Scalp from too many hot irons or heated curling irons and the sun and heat during summer and swimming pool chlorine. Hands and Feet to soften and remove calluses and dryness. Dry, Chapped Lips, Cuticles, and Stretch Marks that can happen over time from weather, water, and weight gain. Acne from over production of sebaceous glands. Pierced Ears when the holes become clogged after not wearing earrings for a time. Beards that men like to feel soft and natural rather than rough and harsh is accomplished with the best Jojoba Oil brands. For all of us animal lovers, know that Leven Rose® never tests their products on animals. It is cruelty-free. 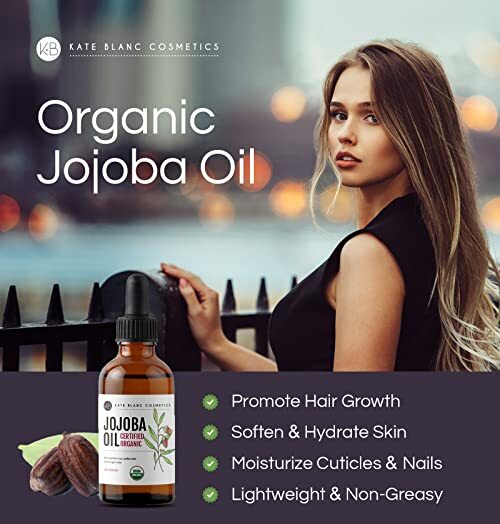 Enjoy the Jojoba Oil benefits from this all natural organic Jojoba Oil that’s easy for your hair and skin to absorb and be nourished. 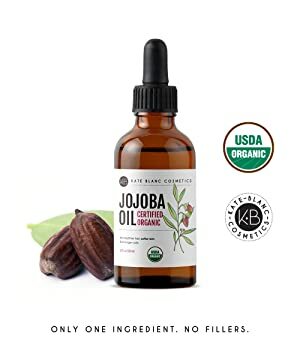 This brand Jojoba Oil is organic, but their facility is not certified USDA Organic. It will keep and not expire for 3-years. Do not use on sensitive baby skin or mix with essential oils in a diffuser. It is too thick to move through the tubes in a diffuser and will clog it. The Jojoba Oil has a lifetime guarantee so you have nothing to lose. How to use Leven Rose® Jojoba Oil video. The Cliganic™ brand is USDA Organic and is hexane-free. This is a no brainer since hexane is an alkane. Hexanes are found in gasoline and is a solvent in many products and are used to extract cooking oils such as soy and canola from the plant’s seeds. So choose your carrier oils wisely and be sure they are hexane-free. The FDA does not regulate this contaminant and it is a controversial subject. Cliganic™ is used for your face and hair and as a carrier oil for massages. It is unrefined, cold-pressed, and 100% all natural for the vital care of your skin and hair health. Use on your nails, cuticles, face, removal of makeup and mascara, and to open pierced ear openings. It’s also great for men’s beards and moustaches. It’s perfect for all skin types and skin color. It is a natural moisturizer containing vitamin E, B-complex, and is excellent at resisting and fighting bacteria. It is never toxic and is always an anti-inflammatory agent. There are no chemical additives or alcohol in this oil. The seeds are sourced from Argentina, Peru, Israel, and the USA then bottled in the USA. Its shelf-life is 3-years. There is no scent so no need to put into a diffuser and it won’t work anyway. Mix it with your essential oils for a heavenly relaxing massage. Never dilute it with water! Oil and water don’t mix and you don’t want to thin it down besides. Jojoba Oil is for external use only. Keep away from flames and high heat and out of reach of children and pets. Discontinue the use immediately if redness or irritation occurs. It is vegan and cruelty-free never using animals for testing. It comes in a 4-ounce glass amber bottle with a glass dropper. You will have a no-risk Cliganic™ 90-day satisfaction Guarantee. 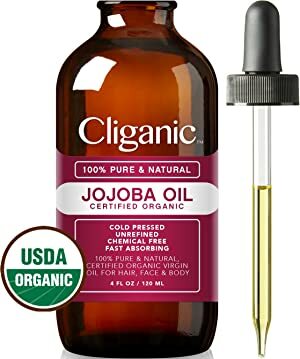 If you are not completely satisfied with your purchase, Cliganic™ will be happy to replace your Jojoba Oil or issue you a full refund, no questions asked. Simply let them know within 90-days after your purchase and receiving. 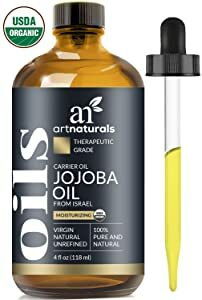 The ArtNaturals® brand is a top selling Jojoba Oil on Amazon.com® at an affordable price for the 4-ounce glass amber bottle and glass dropper. It is 100% therapeutic and unrefined. Jojoba Oil is one of the most multipurpose oils available. With its excessive vitamin E content it is the perfect Jojoba Oil for skin moisture, clear skin, and has antioxidants to get rid of free radicals. It has a gentle astringent action for cleaning your pores deeply with no irritation to your skin. It is paraben-free and animals are never used for testing. Jojoba Oil from ArtNaturals® has a recipe below for sunburns and it works well because I’ve used it. Artnaturals® Organic Jojoba Oil review video. The Kate Blanc Cosmetics brand of Jojoba Oil is USDA certified and cold-pressed being hexane-free. It is pure and authentic with nothing fake included. It will soften your skin leaving it with a radiant glow. Moisturize your skin, nails, cuticles, and hair with results you can see. It absorbs into your skin with no residual oiliness. Help to reduce wrinkles, stretch marks, and remove mascara and face makeup with this Jojoba Oil. 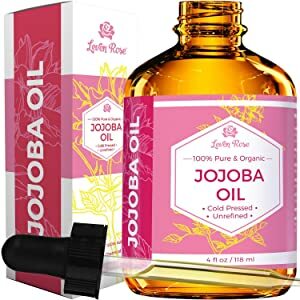 Jojoba Oil keeps your face and body moisturized and reduces blemishes, acne, pimples, scars, rosacea, eczema, psoriasis, chapped skin, and fine lines without leaving your skin dry. It’s a super lip balm for dry lips and helps with sunburn pain. It is supposed to stimulate hair growth from hair loss that’s not due to thyroid or genetic reasons. It moisturizers a dry scalp, brittle frizzy split-end hair, and dandruff. It’s also a natural shampoo or conditioner or both. For the men, it helps their beard and moustache stay soft and moisturized. It is a popular ingredient in hair growth products. The company gives you a 100% Guarantee with a 1-year Warranty if you are not completely satisfied. The Viva® Naturals brand of Jojoba Oil keeps your skin soft and hydrated. The 4-ounce (118 mL) bottle is affordable with a unique top to prevent spills at Amazon.com®. It is USDA organic and cold-pressed. It is hexane- and GMO-free. As you know, your body produces its own natural oils called sebum, but everyday life and weather, the environment and harsh chemicals can deplete the natural oils, leaving your skin feeling dried out, and your hair feeling like straw. 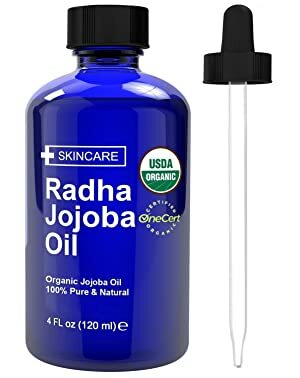 Never have greasy feeling skin using this organic Jojoba Oil best for face, body, hair, nails, and beard. Being cold-pressed, it keeps Jojoba’s healthy fatty acids, the stuff your skin and hair absorbs as moisture, intact. It will condition and soften brittle dry ends of your hair. Use alone or add to shampoo or conditioner. Get your beautiful hair back into shape today and you might need to get the split ends cut off. For a do-it-yourself hair treatment heat 1- to 2-1/2 tablespoons of Viva® Naturals Jojoba Oil in a freezer bag by submerging the bag in hot (not boiling) water. Then, massage the oil into your hair and scalp. Long hair? You can also dip the ends into the oil to soak it up. Cover your hair with a shower cap, then wrap a towel around the shower cap. Let it sit for at least 20-minutes or overnight for even deeper moisturizing, then rinse out and towel dry gently squeezing your hair, never rubbing. For external use only. Keep away from heat and open flame. Keep out of reach of children and pets. Viva® Naturals stands by their products 100%, but if any of them don’t meet your expectations, let them know within 90-days of your purchase for a full refund, no questions asked. Viva® Naturals Organic Jojoba Oil review video. 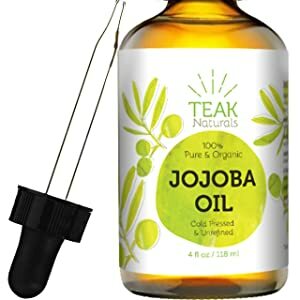 The Teak Naturals brand of Jojoba Oil is excellent for moisturizing your hair, skin, nails, and cuticles. It is 100% pure organic and unrefined being cold-pressed. It has no fragrance, has vitamins and fatty acids to keep your skin, hair, and nails hydrated and full of moisture. Use on dry lips, face, stretch marks, beard dryness and itch in men and use as the best carrier oil for essential oils for a relaxing massage. It is never oily and is an antioxidant inflammatory agent. It’s used for all skin types: dry, normal, and oily and is great for acne too. For hair and body, the natural vitamins from Jojoba seeds will repair and nourish dry, frizzy, and brittle hair. Jojoba Oil is rich in Vitamin E and Vitamin B5 making it a fantastic moisturizer and an anti-inflammatory and antioxidant oil, fighting damage caused by sun and free radicals. Use on sunburn or sun damaged skin to help heal and reduce the effects of sun damage on skin while simultaneously soothing and healing the damage. The golden Jojoba Oil is processed with a pure processing that naturally leaves all the nutrients in the oil to easily nourish your skin and hair without any sticky or waxy residue. Perfect as a carrier oil for applying or mixing essential oils, Jojoba Oil is great for using on arms, hands, cuticles, décolletage, face, and hair. Teak Naturals Jojoba Oil is completely free of parabens and fragrance and is unscented, undiluted, and kosher. Try out the Teak Naturals brand oil risk-free; love it or they will refund or replace. The NOW® Foods brand has a reputation for the finest products over the past 50-years. The inexpensive 8-ounce bottle is non-GMO, hexane-free, expeller-pressed and USDA organic certified. Check it out on Amazon.com® for other size bottles available. It is indeed a 100% pure moisturizing oil for your hair, body, face, nails, cuticles, and all of you because of its versatility. In need of healthier-looking hair, softer skin, or an oil for general bath care and massage? This is ideal for that. Its high stability, invigorating nutty scent and cosmetic versatility make it ideal for all skin and hair types, and it is most commonly used to promote softer hair and skin. Jojoba Oil contains many nutritional compounds, including long-chain essential fatty acids and fatty alcohols. NOW® Solutions products are not tested on animals. The clear plastic bottle contains UV light protectants to keep sun’s ultraviolet rays out. NOW® Foods Solutions Certified Organic Jojoba Oil MIRACLE 4 SKIN review video. The Majestic Pure™ Cosmeceuticals brand is 100% pure and natural. The 4-ounce bottle is affordable and wonderful for skin, hair, and used as a carrier oil with 100% pure essential oils for a body massage. It is stable with a long shelf life and has no additives for freshness and is high quality. It is light yellow or colorless and has no odor. It is for external use only. Rub a very small amount on the inside of your elbow area to test for any allergic reaction before use. Avoid contact with eyes, keep out of the reach of children and pets. If pregnant, consult with your health care provider before use. With the many different varieties of tocopherols that make up vitamin E and many other natural minerals, it’s a sure bet to keep your skin naturally hydrated. It contains myristic acid and phytosterols that are known for their anti-inflammatory actions and for being similar in composition to that of the skin’s own oils, sebum. The bottle is amber glass with a glass dropper for easily dispensing individual drops. This oil provides all day moisturization – Jojoba Oil doesn’t evaporate like water-based moisturizers. It contains antioxidants and can be used as a makeup remover and is beneficial for all types of hair. It will act as the best organic hair conditioner and is known to moisturize hair follicles and protect them against any damage or becoming weak and dull. The Radha Beauty brand is USDA certified organic and it acts the same as your skin’s natural oil, sebum. This means as you age and the body loses its ability to make sebum, you can always be healthy and soft. It is perfect for dry itchy skin from the environment and elements and is never greasy. It is antibacterial and anti-inflammatory to help against dandruff, acne, and wrinkles. With its natural vitamin B and E, it will even help to remove dark aging spots and tighten pores. Men love it to soften and maintain a perfect beard or moustache. All Jojoba Oils are for external use only. Discontinue use if irritation occurs. Keep out of reach of children and pets. Radha Beauty provides the products we love with a 100% money back Guarantee. If you are not 100% satisfied, Radha guarantees a full refund while providing the product as a gift to you, on them! Radha Beauty Jojoba Oil video. The Teddie Organics™ brand of golden Jojoba Oil 100% pure organic cold-pressed and unrefined 4-ounce bottle in dark amber glass with a glass dropper for ease of use dispensing individual drops is handy and oh-so convenient. This is a natural moisturizer for your face, hair, and sensitive skin, and is used as a carrier oil for essential oils for a massage, but never put into a diffuser. For all skin types and hair color, this multi-purpose moisturizer is the best Jojoba Oil for hair from too much hair drying and sun. It will minimize fine lines and wrinkles, help with scarring, acne, elasticity, and skin tone to prevent dryness. As a makeup and mascara remover, nothing works better. It’s an excellent scalp and hair conditioner that you can leave in and also mix with your shampoo. This is an excellent Jojoba Oil for massage used with your essential oils. For men, this is the best Jojoba Oil for beards and moustaches. The oil is 100% pure virgin and is hexane-, paraben-, and additive-free. Your satisfaction is 100% guaranteed or your money will be refunded. Teddie Organics™ Jojoba Oil video. On another note, I have written about the best-smelling essential oils for diffusers that I like on another page at this site. I think you’ll be pleased with it. Let me know. Whether you are a beginner, a seasoned user, or professional, you might like to know what I find are the best-smelling essential oils for a massage or just to please your nose and sensibilities. Go read about those essential oils here. 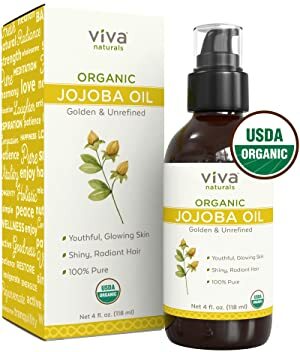 Amazon.com is where to buy Jojoba Oil for the best hair and skin care bar none. Leave a note in the comments section at the bottom telling me and everyone your favorites too. I will reply to each of you. Happy shopping for soft skin!